F.A. 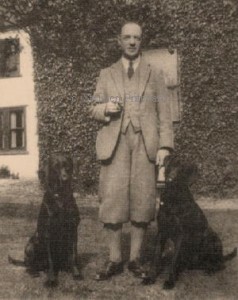 Stewart aka Frank Algernon Stewart with his dogs in his garden at home. Frank Algernon Stewart became war artist to the illustrated London News, The Illustrated Sporting and Dramatic News and The Graphic. In October 1899 he went to Africa where he saw action in Colenso, Spion Kop, Monti Christo and the relief of Ladysmith. He was invalided home and in 1901 went to Paris to study at Julian’s. On returning to England F.A. Stewart married twice and spent the later part of his life at Southern House, Cheltenham, Gloucestershire. Stewart was a keen Hunting man and his works were predominantly of hunting scenes. 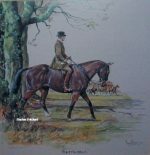 In later life Stewart was forced to give up Hunting as a result of an operation, but he continued to follow Hounds on foot, making many sketches whilst doing so. When he died at Cheltenham in 1945, FA Stewart’s effects totalled only £279, although it is said that he had a reputation for lavish entertaining and was not a poor man. F.A. Stewart painted many different hunts, which as well as being a portrayal of the Hunt also contained very accurate human portraits. A contemporary of Lionel Edwards, he was ranked as one of the leading Sporting Artists of the day. His work, normally in watercolour was very fine, but slightly less free than Edwards. 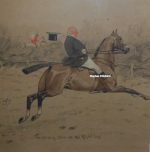 FA Stewart’s horses are very well drawn and he obviously understood Hunting. His colouring was fresh, clean and convincing. He favoured a long narrow shape for his pictures which gave a panoramic view of the field streaming across a fence or country. A number of these pictures were reproduced by Vicars Brothers in the 1930’s, with whom Stewart exhibited annually. As with other artists, he does not appear to have exhibited anywhere else.